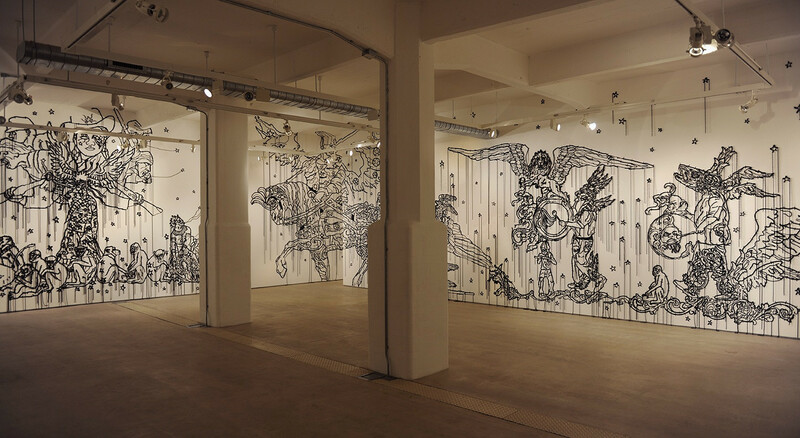 Hew Locke (b. Edinburgh, UK, 1959) spent his formative years (1966–80) in Guyana before returning to the UK to complete an MA in sculpture at the Royal College of Art (1994). Locke explores the languages of colonial and post-colonial power, how different cultures fashion their identities through visual symbols of authority, and how these representations are altered by the passage of time. These explorations have led Locke to a wide range of subject matters, imagery and media, assembling sources across time and space in his deeply layered artworks. Coats-of-arms, public statuary, trophies, weaponry, naval warships and the costumes and regalia of state are appropriated in Locke’s sculptures, wall-hangings, installations and photographs in a continued deconstruction of state power’s iconicity and histories. Particularly renowned are his early portraits of the Queen and other monarchical figures, traditional symbols of imperial authority represented in order to consider its contemporary and commercial relevance. These portraits, however, are just one motif in Locke’s ongoing examination of the economies of power. More recently, Locke has explored ships as images, objects and also physical sites for artistic interventions, discovering in the ship a potent symbolism as an instrument of control in warfare, trade and culture. He has also initiated a series of altered share certificates, now-obsolete documents referring to this same violent, turbulent history of colonial trade, ownership and power, as well as subtly referencing the contemporary art world’s participation in commodity culture. Across his work, Locke’s ability to fuse existing material and historic sources with his own political or cultural concerns, whether via visual juxtapositions or through the re-working of a pre-existing object or photograph, leads to witty and innovative amalgamations of history and modernity. This layering of time is accompanied by a unique merging of influences from the artist’s native Guyana and London, where Locke now lives and works, leading to richly textured, visually vibrant pieces that stand on a crossroad of histories, cultures and media. Locke’s works have been included in The Folkestone Triennial (2011), the 54th, 55th and 57th Venice Biennale (2011, 2013, 2017), Deptford X (2012, participating artist curator), Prospect New Orleans Contemporary Art Biennial, New Orleans, LA, USA (2014) and Hangzhou Triennial of Fiber Art (2016). In 2010, Locke's work, Sikandar, was shortlisted for the Fourth Plinth, Trafalgar Square (London). In 2015, Hew Locke was commissioned by Surrey County Council and National Trust to create The Jurors, a public artwork at Runnymede commemorating the 800th anniversary of the sealing of the Magna Carta. and nominated for the PMSA's 2016 Marsh Award for excellence in public sculpture. His work was also recently included in the major exhibition Artist and Empire at Tate Britain (2015–16), travelling to the National Gallery of Singapore. Selected shows include National Portrait Gallery (London), Imperial War Museum (London), El Museo de Bario (New York), Fondation Clément (Martinique), the Bell House (Prague), Kunsthal KAdE (Netherlands), Tate Britain (London), V&A Museum (London), the New Art Gallery (Walsall), Rivington Place (London), the Bluecoat Gallery (Liverpool), the British Museum (London), the New Art Exchange (Nottingham), the Luckman Gallery (LA), the New York Museum of Art and Design (New York), Atlanta Contemporary Arts (US), the Brooklyn Museum (New York), and Perez Art Museum Miami (FL, USA). Locke's work is represented in many collections including the Government Art Collection (UK), Miami Art Museum (US), Tate Gallery (UK), the Arts Council of England (UK), the Collection of Eileen and Peter Norton (US), the Brooklyn Museum (New York), the Arnold Lehman Collection (US), Perez Art Museum Miami (US), the Kemper Museum of Contemporary Art (US), Kansas City Collection (US), the RISD Museum (Rhode Island), the New Art Gallery (Walsall), Victoria & Albert Museum Drawing Collection (London), the British Museum (London) and the Henry Moore Institute (Leeds).